If your laptop can run Windows 8, Windows 10, or is a Chromebook, then AirBar can turn it into a touchscreen in a matter of seconds. If you take a look around the laptop section of your local electronics store today, you’ll see that touchscreens are popular, but they’re still not everywhere – they also inflate the device costs a bit. In the past, if you didn’t purchase a laptop with touchscreen support, you wouldn’t be able to do anything about it in the future. Today however, things have changed and there’s now an affordable way to add touchscreen support to your PC or Chromebook display. 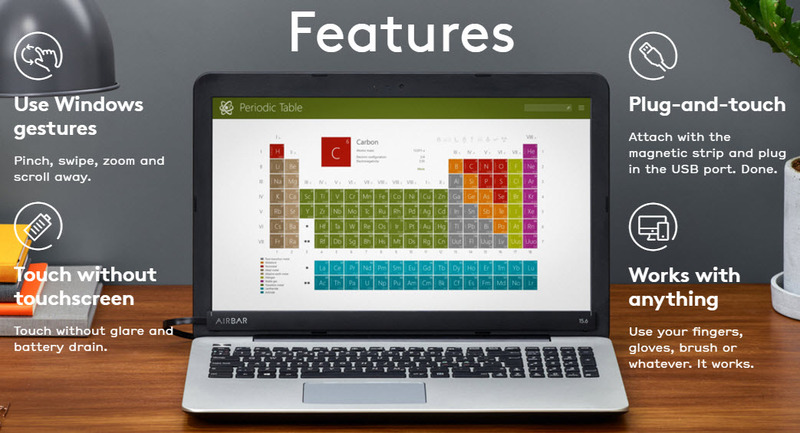 AirBar, created by Neonode, is a small bar that magnetically attaches to a bottom of a laptop screen, plugs into a USB port, and then emits an invisible beam of light to track movement and convert the standard screen into a touchscreen. Unlike traditional touch screensthough, Airbar works with fingers, brushes, gloves, and even chopsticks. When you’re done and need to pack everything up, you just need to unplug the device and slide it off your laptop. The technology behind Airbar is built on the Neonode zForce Air system which uses invisible light to sense activity around the device. When the beams of light are disrupted, the sensors then relay that information to the connected device as a form of movement. The zForce (short for Zero Force) system isn’t just for laptops; it’s designed to be incorporated in general electronics such as tablets, appliances, toys, and gaming systems. According to the Neonode technology page, the zForce system is continuously calibrated in order to work with all types of light. The calibration also helps to compensate for dust, wear out and other small particles on the optical surfaces, and variation in component quality. The technical specs mention the sensors have a resolution of 200 DPI which provides the precision of writing with a pen. Though the AirBar device is pretty new, Neonode has been around for a few years now – The Stockholm based company is publicly traded and their technologies are used by numerous hardware companies (automotive, appliance, wearable, office equipment, etc.) across the globe. As specialists in the optical sensory space, Neonode also develops sensors for wearables that enable users to control their smart watches by touching their wrists; similar to SkinTrack about which we have previously written. AirBar is currently available for pre-order on the company website for $69, with an estimated ship date for the “first-half of 2016”. The bar is designed to work with Windows 8 and above, and Chrome OS devices with 11.6”, 13.3”, 14” and 15.6” screens. At the moment the device is not compatible with OS X devices. I keep reading that the airbar will work with a Chromebook. On my 14″ HP Chromebook, the airbar is just a crumbcatcher below the display. The thing’s running the latest version of Chrome OS on the stable channel, but all I get is the VERY useful beeeeep when I place my hand on top of the display to close it. Am I doing something wrong, or are perhaps all Chromebooks not created equal as regards ye airbar? I’m grateful for any information. Wouldn’t mind one for my desktop’s 27 inch monitor. It would have to work on Linux but I would definitely get one at the right price. Awsome gadget! However 70 USD is too expensive for my taste. Cool gadget. The price point is right on and as long as the company can figure out the OS X part, things should be good for them. The OS X problem is since there’s no such thing as a touch screen Mac, the OS has no support for touch. Sure you could emulate a mouse, but trying to tap on tiny screen elements like the windows close button with my pudgy fingers is gonna be a bad time. Very cool and the fact that it will act as a “pen”, that is cool. For me, the OS version will make more sense, I hope they make one. This is a nice gadget. The fact that it is so small is going to be a MAJOR selling point for sure. Very neat. I might be able to find a couple of reasons to use this on my laptop. With it being so compact, I can see how this would be a desirable gadget to have.